Share your scheduleScheduling is easy if you know when everyone is free or busy. Let your co-workers, family, and friends see your calendar, and view schedules that others have shared with you. Learn how to share your calendar. Get your calendar on the goAccess your calendar when you're away from your desk with two-way syncing to your phone or tablet. You can use a mobile version of Google Calendar made for small screens or a calendar built in to your phone. Learn how to sync your calendar with a mobile device. Never forget another eventStay on schedule using reminders. You can choose to be notified by email or receive text messages directly to your mobile phone. Learn about reminders and notifications. Send invitations and track RSVPsInvite other people to events. Guests can RSVP to your events by email or via Google Calendar. Learn how to invite guests to your event. Sync with your desktop applicationsIf you use Apple iCal or Mozilla Sunbird, you can sync Google Calendar with these desktop applications. Work offlineKnow where you’re supposed to be even when you don’t have Internet access. Withoffline access, you can check your calendar wherever you are. This is a very exciting moment, you're about to create your first prezi. If you haven't already, check out the video tutorial on the previous page. Alternatively, you can look through the information below to get some more hints and tips on creating your first zooming masterpiece. 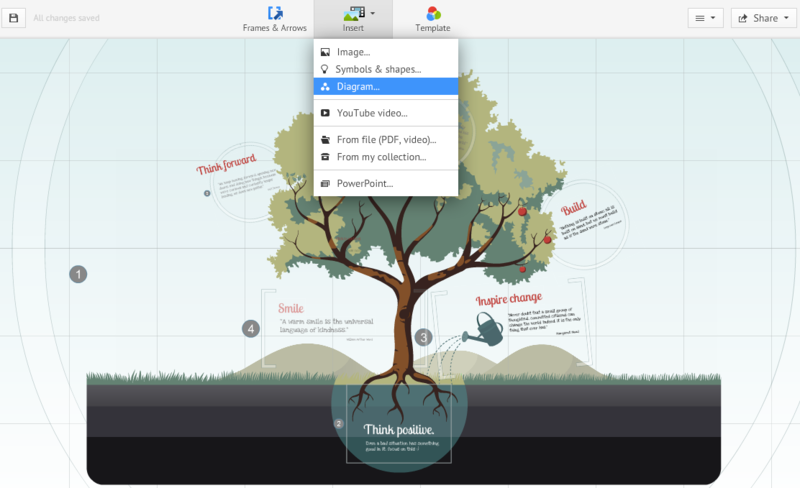 Getting around your prezi canvas couldn’t be easier. Zooming around: This is a key feature of Prezi, so naturally we made it simple. You can zoom in and out by using your mouse’s scroll wheel or by clicking the + and - symbols on the right hand side of your screen. Panning: To move your prezi canvas left, right, up, or down, hold down the left button of your mouse and then move in the direction you want to go. 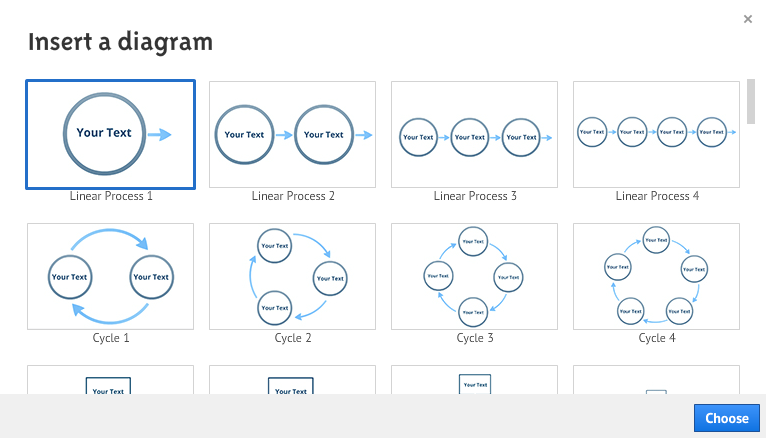 In Prezi, the Transformation Tool is your best friend. Once you add anything to your canvas, click on it once to bring up the Transformation Tool. Now you can move, size, and rotate your content any way you like. If you add a frame to your prezi, you can click on it once to bring up the Transformation Tool and move, scale, or rotate everything inside. When you create a prezi, you can choose from a number of reusable templates or a blank canvas. 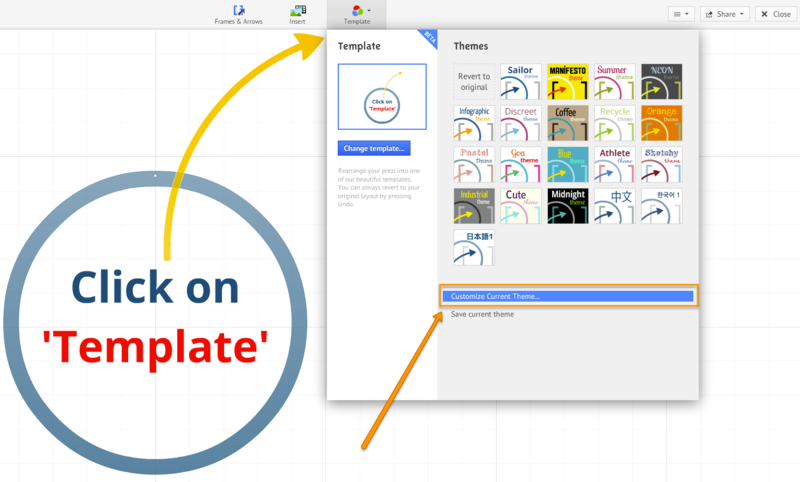 When you decide to use a template, you can edit everything you see on the canvas just as if you were creating your own prezi, including copying and pasting pre-made content from other prezis or applications. 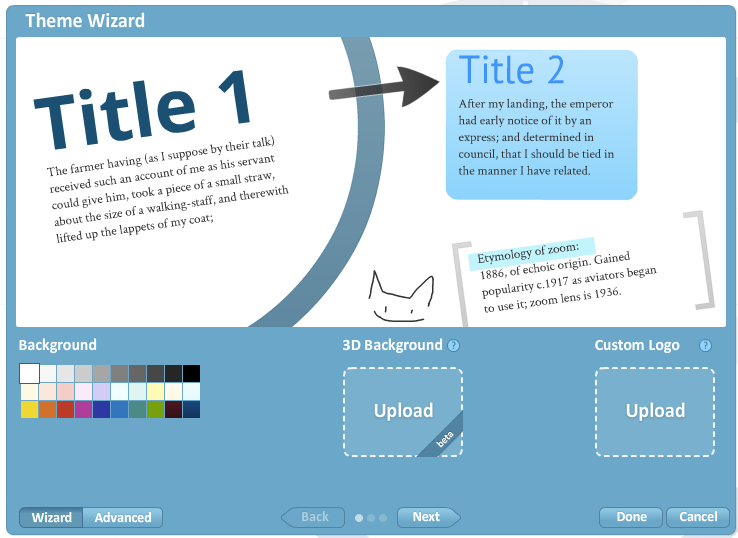 Use the Theme Wizard to customize the colors of your prezi and to set your font choices from Prezi's font library. You can also create branded Prezi themes by adding your exact company colors to the wizard. Paying users (Pro, EduPro, Enjoy, and EduEnjoy license holders) can even add their own logo to a customized theme. To take a step back and get an overview of everything you've added so far (both in Edit and Present mode), you can use the Home button on the right hand side of your screen (you can find it just above the zoom + and - buttons). Clicking the Home button before you start making a prezi will also ensure that you're starting from the right place. Frames are a signature part of Prezi and a great way to manage your content. Frames work like slides and can be used to group your ideas. Use frames to create a placeholder in your prezi and then add content to them. Frames come in a variety of shapes and sizes, and you can change the color of them as well as their size and position. The other great thing about frames is that once you place one on your prezi canvas, you can move, size, and rotate it, and all the content within your frame will move, size, and rotate too. Choose 'Frames & Arrows' from the top menu. From here you can select 'Add frame' and Prezi will automatically place a frame onto your prezi canvas next to the content that you have been working on. Alternatively, you can select the kind of frame you would like to add from the list. 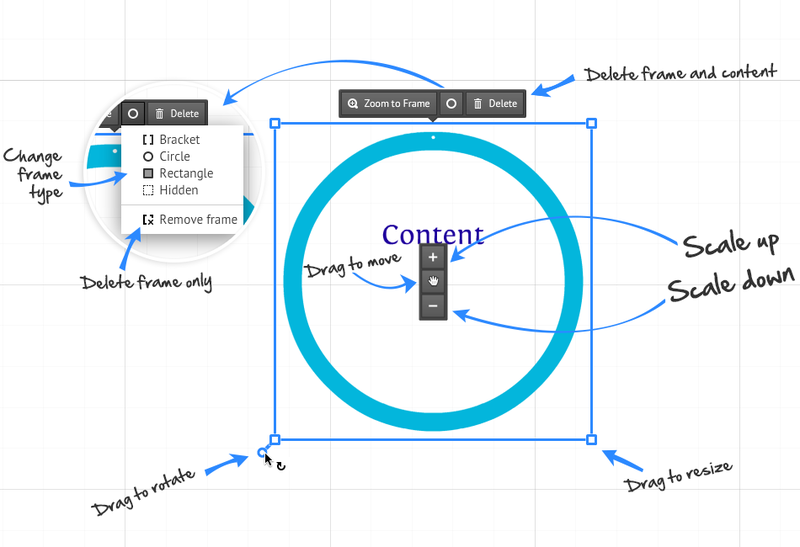 Adding a frame will automatically add another step to your prezi’s path. Prezi has created layout drawings, diagrams, and charts that can help you better communicate your ideas to your audience. Quickly add content to your drawings, and duplicate them (using the right-click menu or keyboard shortcuts) to start filling your prezi with inspiring content. Click 'Insert' and then select the ‘Symbols and shapes’ icon at the top of the screen to add shapes, lines, arrows, and more to your prezi. Insert rectangles, circles, and triangles to frame your content. Alternatively, add symbols from a huge library or purpose designed drawings to further enhance your prezi. To put live links into your prezi, copy and paste the desired URL into a text box. Then click away from the text box and your link will become active (you will see it automatically underline). When presenting your ideas, it can sometimes help to have a clear narrative that takes your audience through your prezi. With the Left Sidebar, you can create a journey from one idea to the next. Edit your path and its points in Edit mode and take your audience along that path in Present mode. To set your path, click the ‘Edit Path’ button on the left-hand side of screen. Then click on the objects in your prezi canvas in the order you wish them to appear. You can also use the Edit Path sidebar to add new path points. Use the sidebar to rearrange and delete path points or to zoom to a specific path point. 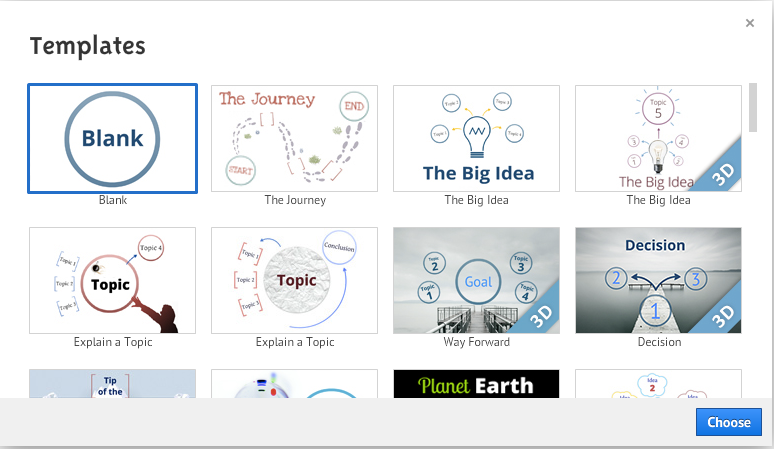 On the Prezi Explore page you can find loads of great prezis from which you can “borrow” content, animations or even sound effects. Reusing content in this way allows you to share your ideas more effectively and is a great way to get started with Prezi. To use content from another prezi, first select a reusable prezi you like from the Explore page, then click ‘Save a copy’ to place a copy of the prezi in your own prezi library. From here, you can open the prezi and start putting your own content into it. Alternatively, cut and paste the elements you like into one of your own prezis. To start creating drawings in Google Docs, go to your Docs list, click the red Create button and select Drawing. Then, use the menu options and the buttons in the toolbar to create flow charts, design diagrams, and other types of drawings. 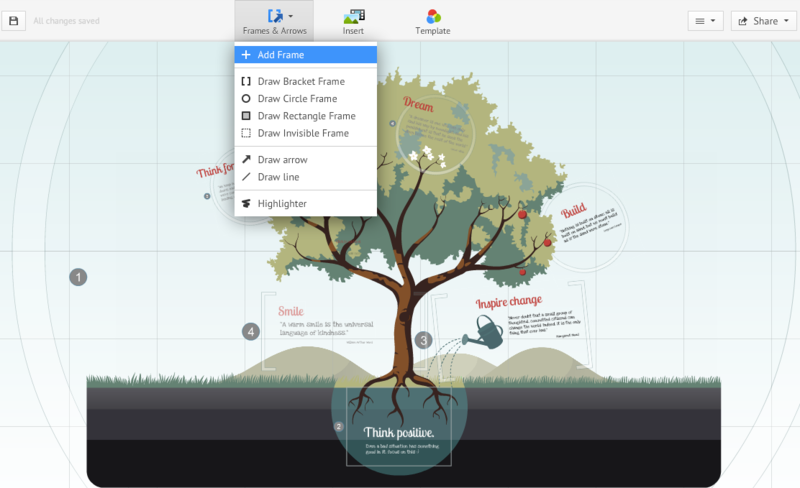 Once you're done, you can add your drawing to your document, presentation, or spreadsheet. Click this drop-down menu to cut, copy, paste, duplicate, and change a shape. Line: Click to place one end of the line, and drag to the other end. 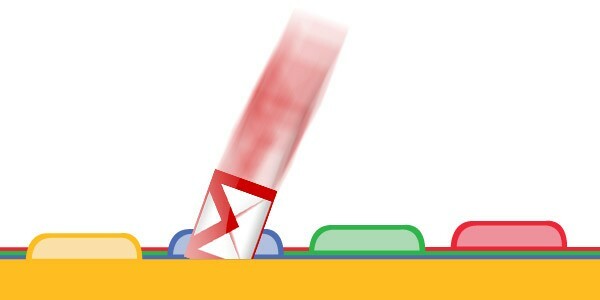 Arrow: Click anywhere to place the end of the arrow, and drag to add the arrowhead. Scribble: Click to choose your start point, and drag to create the scribble. It will be automatically smoothed out once you've finished. In line, arrow, and scribble modes, you'll keep adding lines until you go back to select mode by clicking the Select button from the toolbar (the small arrow to the left of the Shapes button), or pressing the Esc key. Polyline: Add continuous lines composed of multiple segments by drawing a segment of your polyline, clicking to end the segment and beginning your next segment. Learn more about using polylines. Word art: After selecting this option, type your text and press Enter. To zoom in and out on your drawings, click the Zoom button in the toolbar. Select a shape from the Shape menu in the toolbar. Then, click anywhere in Google drawings to insert the shape in the default size, or drag your mouse to change the size of the shape. Create word art by clicking the Shape menu and selecting Word Art (the letter "T" in the second row of shapes). Then, type your text and press Enter. Learn more about using text in Google drawings. All of the shape editing options are available with word art, so you can rotate, choose fill and line color, and change line width. Click the Insert drop-down menu and select Equation. Click the symbol you'd like to include, and add numbers or substitute variables in the box. If you delete the box by mistake, simply click New equation, and then select an option from one of the menus. If you'd like to edit the equation afterwards, simply click the equation within the document and change it. If you don't see the equation toolbar, click View and select Show equation toolbar. 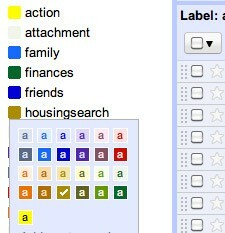 Think of Gmail Labels like old-school folders, only far more powerful. Like folders, you can move messages into and out of Labels, but you can also apply multiple Labels to any given message. While Outlook would balk at putting the same message in your Work, New Project, Action and Expenses folders -- forcing you to strictly sort your e-mail -- Gmail can add all four labels to a message without any trouble. We've spent far too much time thinking about this (so you don't have to), but we opt for a two-tier label system: one based on importance and the other on context. There are countless philosophies for labeling, so find something that works for you. (Type, sender, to-do list and importance are a few ways people organize their mail.) Switched staff works on an Action-Pending-Archives rubric, to decide how to handle a correspondence. Labeling an item as "action" means it needs our attention -- an RSVP, an appointment, responding to someone. We set up an Action label, if you will, for anything we need to act on. Next is a Pending label for things we want to keep visible, but don't necessarily need to be dealt with immediately. After that, everything gets sent to the Archives. Archives is a brilliant aspect of Gmail; with so much room, you can send info to the Archive attic, hidden permanently but never deleted. The next set of labels helps to sort by type and context. Create labels for Family, Friends and Work, and then break down other regular e-mail by Newsletters, Finances, Social Networks, etc. It's easy to go overboard, so take some time to consider the variety of e-mail you get, and focus on creating labels that are broad enough to capture and organize chunks (e.g. Receipts), without being too limiting (e.g. Receipts_October_2010). Let's touch on one last bit of customization before moving on: colors. Adding color (left-click the square next to the label in Gmail's labels sidebar) can make your inbox easier to scan at a glance. Get your Action or Important labels to stand out by setting them as red or yellow. Contrast a cool color palate on Work-related tags with a warm one on family. We prefer a subtle pastel for Facebook, Twitter and other social updates, saving more intense tones for friends and finances. With your newly created labels in mind, let's move to Filters. Labels identify what will appear as what, but you're still going to have to manually add them to e-mail as it hits your inbox. This is where Gmail's filters are an enormous help; they'll sort, modify and label e-mail before it even appears in your inbox. You'll need to do some e-mail soul searching here to gauge the importance of the messages flooding your inbox. Is your daily Gilt Groupe e-mail important? Is your college newsletter worth reading immediately? If not, send these straight to the archive with a tag. Then, you can revisit when you actually have the time. A filter can automatically label every newsletter you receive as a Newsletter, archive it and keep it set as Unread. This way, you won't be getting distracted with new message updates every time a newsletter hits. Because you can set messages to skip the inbox but stay unread, you can still keep track of how many unread missives you've got in the left rail. There's a lot here, so it's time to get creative. 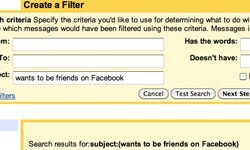 To show the power of filters, let's start with Facebook friend requests. Click "create a filter" at the top of the Gmail page (next to "Search the Web"). Now, in the "Subject:" field, enter "wants to be friends on Facebook". Click next. Apply the appropriate actions. Set this filter up to automatically apply the Social label (or whatever you set up earlier) to every message with this subject. Select "Social" under "Apply a label," set to skip inbox, click Update Filter and Gmail will ask you if you want to apply it to all previous messages. Be careful; browse through the search results and make sure everything is displaying correctly before applying the actions to the results. Now, all of your Facebook friend requests are labeled Social, moved out of your inbox and you can deal with them on your own terms. Next, try family. Gather the e-mail addresses from everyone in your family, create a filter that searches for any e-mails (add "OR" after every address to add multiple people) from familial contacts and labels it "Family." In just a few quick clicks, you can easily label thousands of e-mails spread over several years, without having to go in and manually label any individual e-mail. With online grocery delivery, utility payments, Amazon, iTunes and countless other ways to spend money online, the e-mail receipt is inescapable. Look at the subjects and from: address on your receipts ('Your receipt' or 'Your Monthly Statement from...'), and build a smart filter that automatically labels all incoming receipts. Label incoming newsletters, and then set them to bypass your inbox. Once you have time, you can pull up the Newsletter tag in the left rail, and read through your newest, uh, news. Grab the "from" address in your social network update e-mails and send the flood of Facebook and Twitter directly to the Archives. If you're worried about missing messages, set up special filters to keep direct messages or Facebook notes in your Inbox. As much as we love sites like delicious and Yelp for bookmarking, we often opt to e-mail ourselves reminders. Set up special filters and reminders to catch and sort research, movies and recipes. Filters and labels can be combined to reveal all messages with attachments -- helpful for finding that recent PDF report or gathering all your large files in a single place. While many of these are far nerdier than others (e.g. Keyboard Commands), Gmail pro tips will help the geek in all of us . Speed up your sorting and labeling with Keyboard Shortcuts. Head over to "General" under your Gmail settings, and turn on keyboard shortcuts. Press shift + ? to bring up a reminder for your options; now your fingers don't have to leave the comfort of the keyboard for moving through e-mail. Once you've got your Labels set up, Google Labs' Multiple Inboxes feature is amazingly helpful for letting you see, naturally, Multiple Inboxes. Set one up for e-mail you need to reply to, friend e-mail and anything else you'd like to regularly track. A simple left sidebar plugin, this gadget pulls in a scrollable version of your Google Calendar. If you've got Gmail importing your work, home, ISP and personal e-mail accounts, set up filters and tags to help keep each account organized.